"What exactly is the pirate box?" Go to the corner of Queen and Richmond Streets in downtown Charlottetown. Sit on the bench beside Sir John A. Macdonald. Open an wifi-capable portable device: laptop, mobile phone, tablet, etc. 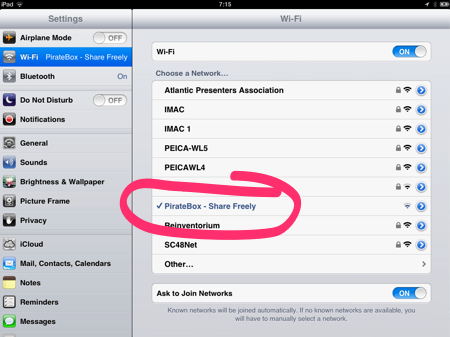 Connect to the wifi SSID PirateBox — Share Freely. Open your web browser and visit http://piratebox.lan/ (or, indeed, any web address). An audiobook of Anne of Green Gables. HTML versions of many of L.M. Montgomery’s works, including Anne of Green Gables, Anne of Avonlea and Rainbow Valley. Several of Cory Doctorow’s books, both as HTML and ePub. Complete set of PDF versions of the Statutes of Prince Edward Island and the City of Charlottetown Bylaws. Several TED videos and some videos about PirateBox itself. A complete set of PEI community histories from IslandLives.ca. What’s more, you can share your own content using the Upload feature: just click Browse or Choose File under “Upload”, select a file you’d like to share, and your file will, once uploaded, become available to others in the “upload” folder. All of this is happening disconnected from the Internet, running off a $35 box that you can buy on Amazon.com using software you can download for free. Written July 29, 2013 at 7:50 a.m. So it’s kind of like geocaching but instead of dollar store trinkets it’s digital material/trinkets.